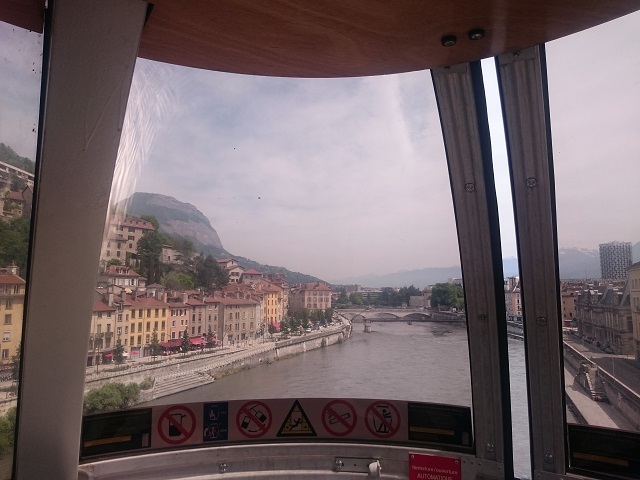 Mountains, a Cable Car and Raclette. Bouncing out of bed early, we began our first full day in Grenoble staying with Hana’s cousin in his shared apartment. Luckily his flat mates were away for the weekend so apart from seeing them a little on Wednesday evening and on Thursday we pretty much had the place to ourselves. We began the day with breakfast looking out over the balcony, rooftops and on to the mountains beyond. The apartment buildings might not be spectacular but the mountains, oh the mountains! 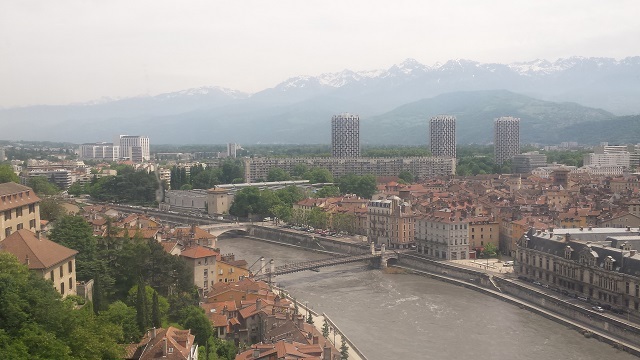 Our plan for the day was to explore and see more of Grenoble itself. 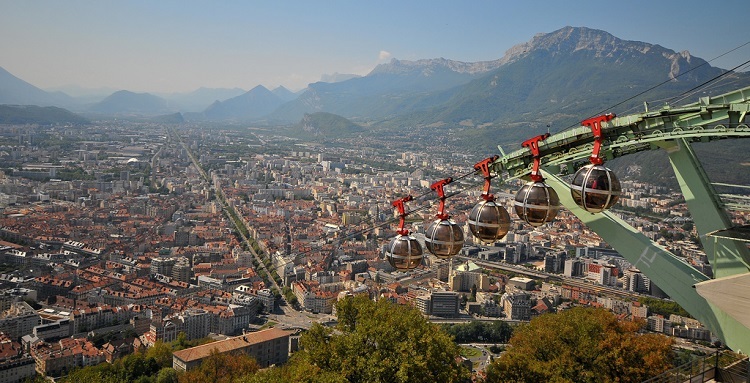 We’d begin with walk to Bastille hill and ride the famous Grenoble cable car to the top. Aside from what promised to be a stunning view of the city, the Bastille hill (as the name suggests) is home to a series of fortifications from wars and conflicts dating all the way back to the middle ages. Although it was early in the morning, the temperature was already starting to climb. We were lucky that the weather was pretty nice for our whole trip. We had one rainy day, but out of an eight day trip that’s not too bad! After breakfast we headed out to walk down the wide boulevards of Grenoble towards the base of the Bastille hill. Along the way we passed so many nice streets and grand boulevards that I just had to keep stopping to get a photo, just like this one on Instagram. Along the we stopped in a nice little bistro for a coffee. God how I adore France and its differentiation between restaurant, cafe, bistro and bar. In England these things almost seem to have morphed into one but in France there is still a big distinction between them. Caffeinated we finished our walk and reached the lower cable car station, by Jardin de ville. I had to share several of the pictures of the fantastic view as you climb. The trip only last around 3-4 minutes but it is definitely worth it for the views you get as you make the gentle 685m climb. Today the Bastille is no longer a working fortress but a tourist attraction with cafe’s restaurants, museums, shops and a rope adventure area. Above the main Bastille fortress you can hike up for another 30 minutes or so to find a memorial to the soldiers who defended Grenoble and the Bastille hill during World War Two. 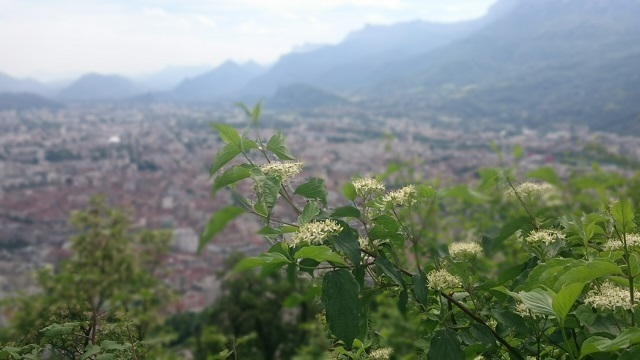 It’s worth hiking up here for the view and to see in a bit more of Grenoble’s history up close. We headed back down to the Bastile and stopped for lunch. I wish I had remembered to take a picture of this, its a truly brilliant idea. I had a pizza. Pretty normal right? But it was topped with cheese, tomatoes and little tiny cheese filled ravioli. Genius, enough said! After a carb-tastic lunch we started the walk back down the mountain. We could have taken the cable-car back down but when it’s a beautiful day it’s worth walking and really seeing everything that an area has to offer. 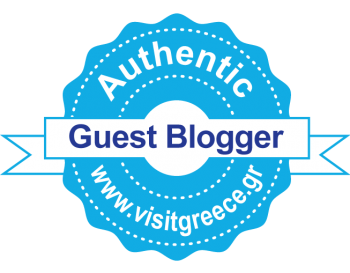 The scenery is beautiful and as you wind your way down the mountain you get different fabulous views of the city and other mountain ranges. 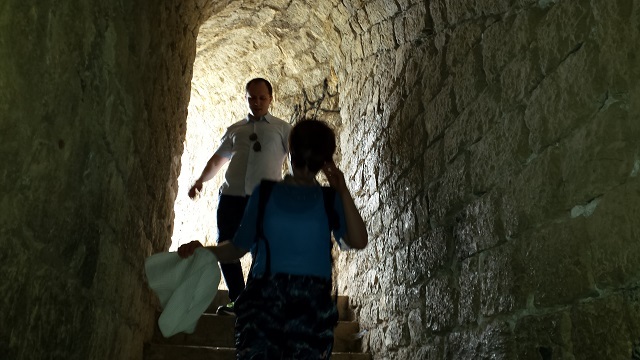 You’ll also walk through parts of the old city fortifications and come out the bottom of the old fortified wall across the bridge from Parc Albert Michallon. 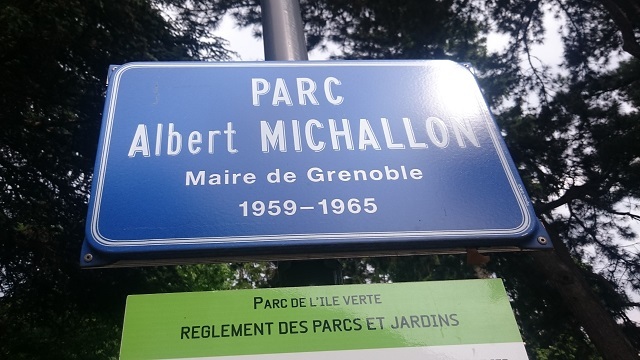 I’d recommend taking a walk around the Parc albert Michallon. 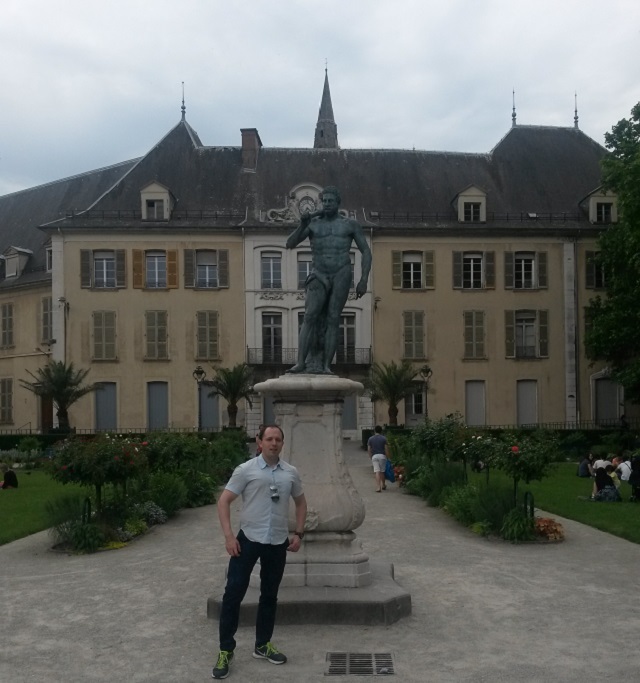 Whilst it isn’t as big or a pretty as the Jardin de ville, it is still a nice place to take a relaxing walk. The park is right next to Grenoble’s art museum which we also visited the next day when the weather was a little less South of France and a little more South of England. Onwards and walking up the street we came across Place Notre Dame, a nice little square, typically French I think. We stopped off at a small bar for a drink and to let our weary legs have a rest after hiking over and down mountains. With legs a little too tired to run all around the town checking it all out, but not yet hungry enough for dinner, we decided to head over to Jardin de ville to chill out on a bench. It is such a pretty park, I love the flowers and we got some great pictures there. I also couldn’t resist getting a picture with Hercules here. Raclette is both a delicious cheese and a dish. 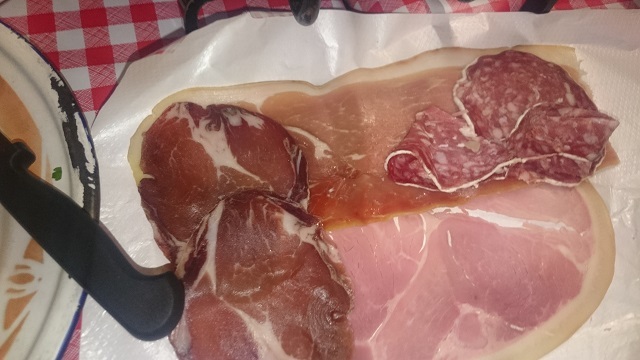 It’s traditional mountain food, the kind of thing you might have after a hard day’s skiing. We hadn’t been skiing but hiking counts too, right? Originally the dish Raclette came from Switzerland but it is also served in Alpine parts of France as well. There isn’t a definitive set of dishes which make up the whole dish of Raclette. 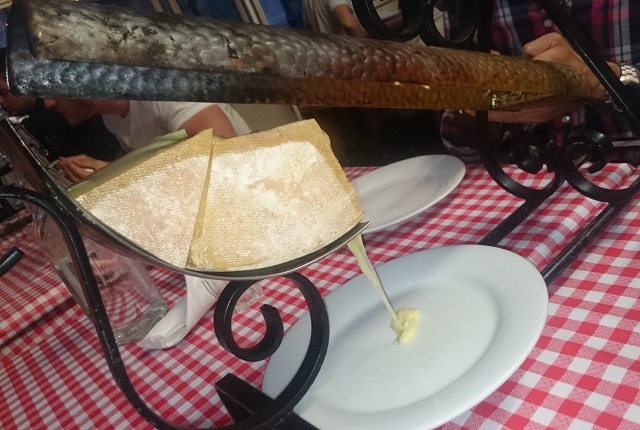 It has to have a big portion of Raclette cheese which is served heated by an electric lamp. The cheese just keep flowing like a beautiful golden river onto a plate below which you use to dip in your other foods. I have a big appetite. At times and insatiably huge gargantuan appetite and a stomach which is seemingly never full but this dish, this dish just about beat me in the end. A big hunk of cheese warmed under an electric lamp. A couple of baked potatoes. Each. 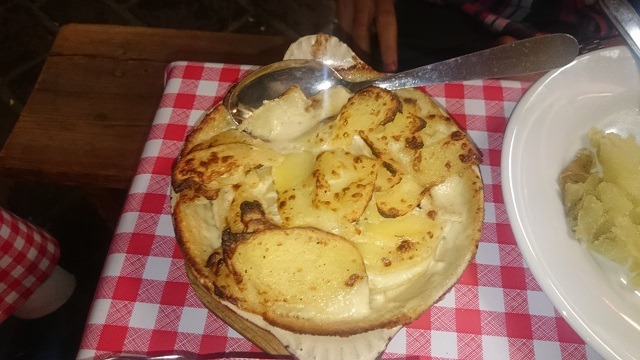 A dish of dauphinoise potatoes between us. 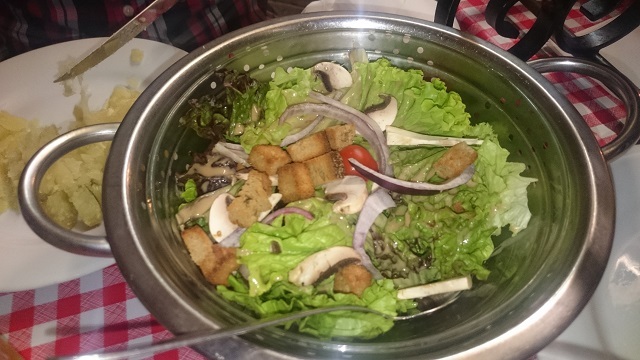 A big salad, which had big chunks of bread with melted goats cheese on. Because more cheese equals winning. There was also the extra salad which Hana ordered between the three of us which I had a stab at as well. I washed it all down with a couple of bottles of the local lager. I think the list doesn’t really just do justice to what we ordered but I hope I managed to give at least something of an impression from the pictures. If you love cheese. If you love oodles of gooey cheese, you have to try this. Whilst we were eating the rain had decided to start really beating down. Sitting in what is a covered over, outside area of the restaurant you could feel the rain lashing at the flimsy walls and dripping down between the gaps between the roof and walls. Thinking ahead I had popped my lightweight waterproof jacket in our backpack Hana had been carrying. Unluckily Hana and her cousin hadn’t. So upon leaving we had just a few minutes to get to the tram stop before it came and were running down a very wet street. I managed to stay dry but I don’t recommend running with a tummy full of cheese. I went to bed that night with a very satisfied tummy, though a little ashamed I couldn’t finish all the Raclette! The thought of that gooey cheese going to waste, what a shame. 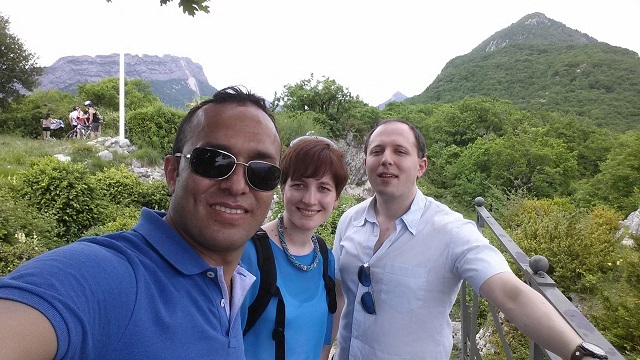 For his part, Hana’s cousin gave us a really lovely first day in Grenoble, showing us around his city and introducing me to one heck of a meal in the evening! Review text and photos By Russell Bowes Find me on Google Plus, catch up and message me on Twitter and see more great pictures on Flickr and Instagram. Pin with me on Pintrest. 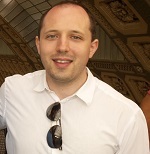 First night at La Fête des Lumières, Lyon, 2018. #fetedeslumieres #lyonfetedeslumieres #lyon. Well worth the trip. RussellsKitchen by Russell Bowes is licensed under a Creative Commons Attribution-NonCommercial-ShareAlike 3.0 Unported License. Based on a work at RussellsKitchen.wordpress.com.